Our high tech equipment and knowledgeable staff will help you receive postage discounts with each mailing. Standard Class, Non-Profit, or First Class – we can help you decide which option is best for you and your project. Our workshare program with the United States Postal Service and the guidelines they have created allow us to presort your mail by zip code for reduced postage rates. 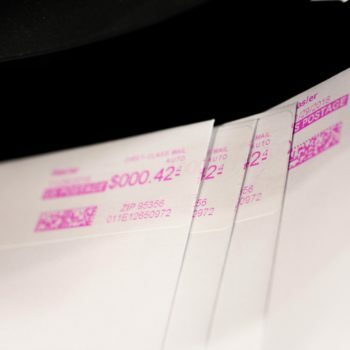 With the use of Intelligent Mail Barcodes, ABS preparation and delivery to the Post Office, your mail is delivered to its intended recipient faster than a stamped piece of mail. For customers with high daily volumes, pick-up and delivery is free. 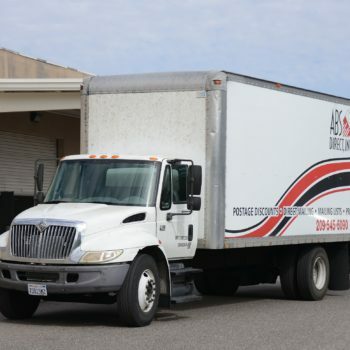 We’ll pick up your out going mail; transport it to our facility to be presorted, labeled, and apply postage. We’ll then transport it directly to the USPS distribution center. Presort Mail is USPS First Class Mail that qualifies for a lower postage rate. By utilizing a USPS Licensed Work Share Partner such as “ABS Direct” you are able to meter your mail at a reduced Postage Rate. ABS Direct and other Licensed Presort Providers are able to co-mingle this mail for the USPS qualifying it for Postage savings of 4.5 cents and more based on volume and type. This is a direct savings to you. What would my Mailroom need to do to qualify and utilize this program? Your Mailroom will function exactly as it does now except you will be placing a lower postage rate on your mail. 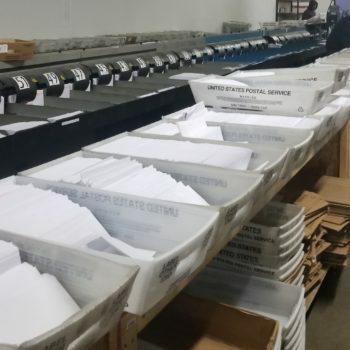 Your Mailroom staff will separate your Letter and Flat size USPS First Class Mail. You will pre-set your Meter Machine to “First Class – Presort” and apply postage on your mail as you do now. This mail will now be given directly to ABS Direct for processing. ABS Direct will set you up on a route for a mutually agreed upon Pick up time. This mail will then be transported to ABS Directs secured USPS Processing facility. It will then be verified and sorted on one of our high speed MLOCR machines to obtain barcodes. This is the same equipment as the USPS and all data/ mail is verified and monitored by the USPS daily. All mail is then verified and entered into the USPS processing facility Same-Day for delivery. How do I know if I qualify for this service? Contact an ABS Direct Representative today for a meeting. You can select either a daily pick up or On-Call whichever works best for your Mailroom volumes. USPS First Class Flat Mail can also qualify for Presort Discounts and a representative can discuss these details with you.